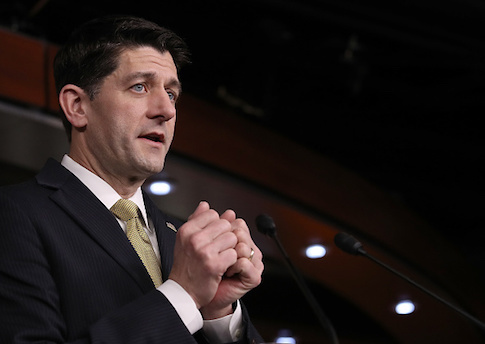 House Speaker Paul Ryan (R., Wis.) on Thursday accused Senate Democrats of using the military as a "bargaining chip" in negotiations on an Obama-era program that protects young undocumented immigrants raised in the United States from deportation. Ryan said Congress is nearing a deal to lift budget caps on defense spending, but blamed "partisan games" for encumbering talks. "What's so frustrating is our military is being used as a bargaining chip for completely unrelated items," Ryan said at an event at the Center for Strategic and International Studies in Washington. "Right now, the defense budget is being held hostage for DACA, which is not a deadline that expires tomorrow," he continued, referring to the controversial Deferred Action Childhood Arrivals program that expires in March. President Donald Trump announced in September his administration would dismantle the program and said Congress must pass legislation to continue protection of the so-called dreamers. Government funding is set to expire on Friday, setting Congress up for yet another short-term spending measure to keep the government open until mid-February. The House is expected to vote Thursday on a continuing resolution to avert a shutdown, but several Democrats have said they will not support a stopgap budget that doesn't include a DACA fix. Senior military officials have repeatedly pleaded with Congress to pass a budget that fully funds the military, warning that the series of temporary measures implemented over the past eight years have stripped the services of essential funding, in turn compromising national security. Republicans will need to team with Democrats to lift spending caps imposed by the 2011 Budget Control Act in order to clear the path for a yearlong budget that includes increases to defense spending. The 2018 defense authorization plan exceeds the caps by roughly $85 billion, meaning lawmakers will have to reconcile the cost of the $700 billion National Defense Authorization Act with current spending limits. Ryan said lawmakers are involved in "good-faith negotiations" to raise the spending limits. Ryan, echoing Trump administration officials and congressional defense hawks, said rebuilding the military is his "highest priority today." "We cannot allow this vital, primary work to be layered into or minimized as Washington melodrama and that's our big issue right now," he said. To underscore the severity of the readiness crisis, Ryan noted that 80 U.S. troops were killed in training accidents last year—four times the number killed in combat. This entry was posted in National Security and tagged DACA, Defense Budget, Military, Paul Ryan. Bookmark the permalink.